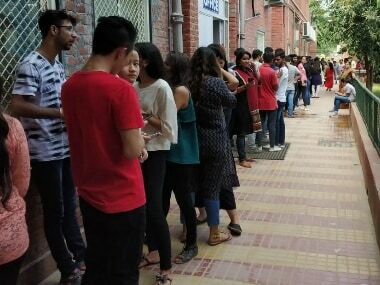 The voting for the elections to the Delhi University Student Union (DUSU) concluded on Wednesday, after being held in the campus in two phases — one for the morning colleges and the other for the evening courses. Around 100 police personnel along with a women police force, were deployed in and around the campus to ensure that voting is carried out without any use of muscle or money power. The police placed barricades at the college entrances and only students and election officials were allowed to enter. Students were checked thoroughly before they were allowed to enter the voting booth and all electronic devices, including mobile phones were prohibited inside the booths. Police also conducted a checking drive around the North Campus to ensure outsiders could not meddle with the elections. 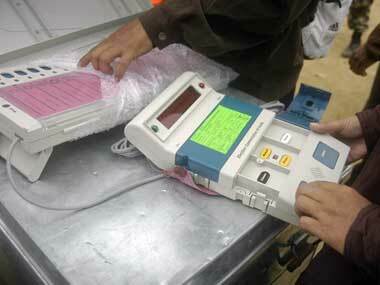 Around 700 electronic voting machines (EVMs) were installed at 52 centres across the university to facilitate voting. The overall voter turnout for the first phase was low as compared to previous years, initial reports suggested. However, official figures are yet to be released. Chandramani Dev, a second year law student, who is contesting for the general secretary post told Firstpost that incidents of violence create tension and fear among students due to which less students turn up for voting. Meanwhile, the All India Students Federation's president, Syed Valiullah Khadri said, that the low voter turnout could favour AISF and SFI. Kunal Ahlawat, a pass out from College of Vocational Studies, blamed the low turnout on the "horrifying scenario" that the ABVP had created in Ramjas College in 2017 and in the Zakir Hussain College on Tuesday. Deepak Chauhan, a third year BSc student at Ramjas College said that, the violence that erupted during Umar Khalid's event at the college has led to a disenchantment with DUSU politics. The students expressed satisfaction over the polling arrangement and said that the voting process was secure and fair. Abhijeet Singh, a student of Motilal Nehru College, was the last student to cast his vote during the day polling. 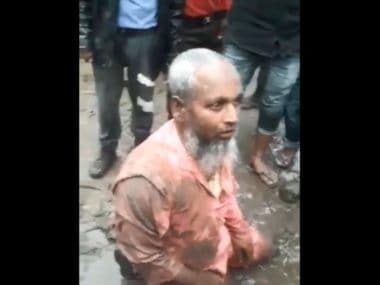 He was made to sign an affidavit in which he wrote down the total number of voters that he saw on the EVM machine while casting his votes, sources told Firstpost. 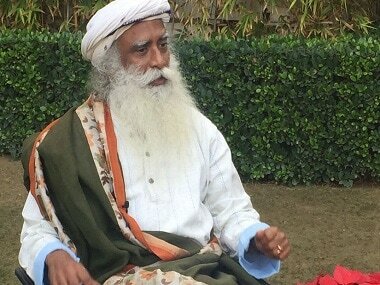 Similarly, the first two students who came to vote were made to sign an affidavit stating that the EVMs recorded zero votes before the polling officially opened. However, NSUI accused ABVP of indulging in violence and alleged that right-wing student body even tried to "buy" votes. Complaints of paper wastage were also raised by some students as hundreds of pamphlets were thrown around the campus. Presence and use of bouncers by the parties was also reported from the campus. Meanwhile, Ankiv Baisoya, the presidential candidate of ABVP told Firstpost that he is confident that his party will win the elections. He said that the violence that occurred on Tuesday was actually NSUI's ploy to egg on ABVP supporters. He said that NSUI members deliberately stopped ABVP candidates from entering the college. The candidates in fray for the president's post are: Ankiv Baisoya (ABVP), Sunny Chillar (NSUI) and Abhigyan (AISA-CYSS), whereas for the post of vice-president are: Shakti Singh (ABVP), Leena (NSUI) and Anshika (AISA-CYSS). According to The Hindustan Times's report, 51 percent voter turnout was reported from ARSD college, while Rajdhani College recorded 51.92 percent polling. Venkateswara College recorded 50 percent votes and Aryabhatta College recorded around 43.9 percent votes. In 2017, the polls saw a 43 percent voter turnout, the report states. The NSUI has promised an "Institute of Eminence" tag for the university if voted to power and has also promised to provide a thali for Rs 10. On the other hand, ABVP has promised to spend 50 percent of the student union budget on women and social justice-related activities along with laying emphasis on sports and installing sanitary pad vending machines in colleges. However, an autonomous organisation fighting against regressive hostel laws for women, Pinjra Tod, tweeted to highlight the low representation of women in the DUSU polls. It also pointed out how only five of 17 women's colleges participated in the DUSU election process and they were encouraged to stay isolated because of the hostile political environment. Meanwhile, the Aam Aadmi Party's student wing, Chhatra Yuva Sangharsh Samiti and All India Students Association (AISA) — which are jointly contesting the polls — have promised installation of CCTV cameras and setting up of police booths on campus to end the culture of "muscle and money power". After the AAP came to power in Delhi in February 2015, its students wing had unsuccessfully contested the DUSU polls. While the voting was underway on Wednesday, the Delhi High Court directed the Delhi Police, Delhi University, and the municipal bodies to file reports indicating the extent of defacement, the steps that were taken to prevent it and action taken against each poll candidate who violated the anti-defacement norms. The direction came after Prashant Manchanda, who filed a PIL in 2017 seeking a complete ban on defacement of public properties by the DUSU poll candidates, submitted a report indicating that littering of pamphlets, pasting of posters and spray painting of walls occurred in 2018 as well in violation of court orders. Students who voted in the DUSU polls said the results will help political parties gauge the mood of young voters ahead of the 2019 Lok Sabha elections. Prakhar Yadav, a second year student of BA (Hons) in Hindi at Hansraj College, told PTI the results of the DUSU polls will indicate which side the young voter is supporting and will help political parties prepare accordingly. 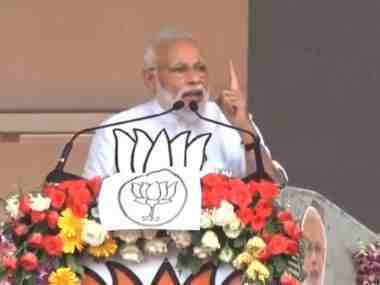 "For instance, the NSUI manifesto had made a pitch for getting the 'Institute of Eminence' tag for the DU, while the ABVP for 'Bharat First' and taking up issues of SC, ST and OBC students. The manifestos also have resonance with issues that are currently being debated and discussed at the national level," Pooja, a student of Kirori Mal College, was quoted as saying by PTI. Another student concurred with Pooja and said the "ABVP has been taking credit for getting the GST waived off on sanitary pads while the AISA-CYSS made a pitch for opposing commericalisation and privatisation" of education if voted to power. A member of the NSUI said the DUSU elections are like the "semi-final for the Lok Sabha elections and will show what the young, educated voter wants". The results will be announced on Thursday. In 2017, the polls saw a 43-percent voter turnout.